Select a constant classic for your binding needs. There’s a reason CombBind spines are the most popular binding choice: they’re durable, versatile and give your projects a perfectly professional presentation. CombBind standard spines are a great choice for everyday binding needs. 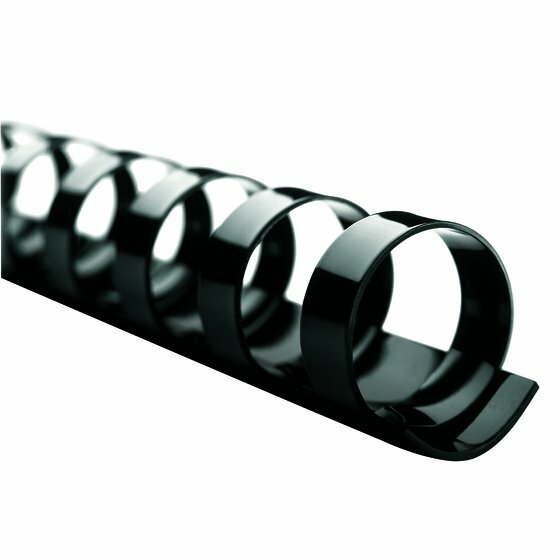 Tasteful black spines provide secure binding, appropriate for almost any situation. Convenient spines are designed for use with GBC CombBind Machines (sold separately). Ideal for use in busy, corporate settings. One of the most popular binding options, CombBind spines are a solid, traditional choice. 19-hole plastic spines are strong, for a secure binding. Durable spines won't scratch, chip, peel or discolor over time. Shiny black spines provide plenty of space to house your printed projects. Professional binding provides extra support for your important projects. Images speak louder than words, and nothing says 'professional' like a perfectly bound presentation. GBC knows this, and with more than 70 years of experience and innovation behind our binding products, we're sure to have the products to make your message heard.